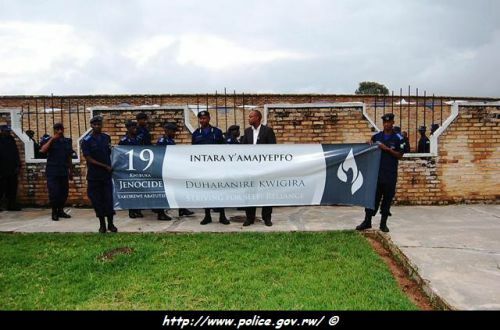 The Rwanda National Police (RNP) yesterday visited genocide memorial sites in different parts of the country to pay tribute to over one million Rwandans, who perished during the 1994 Genocide against the Tutsi as the country continues to remember the one hundred days of massacre. Rwanda National Police was joined by officers from Rwanda Defence Forces, the community and local leaders at different sites to commemorate the 19th anniversary of the genocide. The exercise also included “Walk to Remember” and testimonies of survivors, who embarked on the role played by previous security organs in organizing and executing the genocide. At Kamonyi Genocide Memorial Site in Kamonyi District, the Inspector General of Police, Emmanuel K. Gasana, who was flanked by the DIGP, Stanley Nsabimana and other senior police officers, laid a wreath in honor of over 35, 000 bodies buried there. 19th commemoration event of the 1994 genocide against the Tutsi by Rwanda Civil Aviation Authority ended yesterday. During the event Director General asked Rwandans to continue rebuilding their lives.